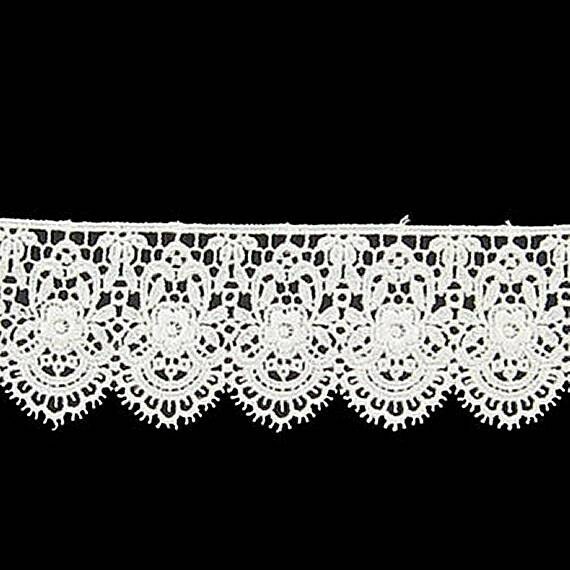 A beautiful 2" wide ivory Venice lace that will add the perfect edge to chemises, partlets, and falling shirt collars or ruffled cuffs. This lace even looks great on Elizabethan court gloves! How about a on a Wedding Dress? It is also suitable for crafting projects like decorating cards, invitations, gift bags and baskets, scrap booking, memory boxes, decorating frames and so many more uses. Let your imagination soar! A sturdy 100% polyester lace, not flimsy or fragile! Strong enough to use on fencing shirts!